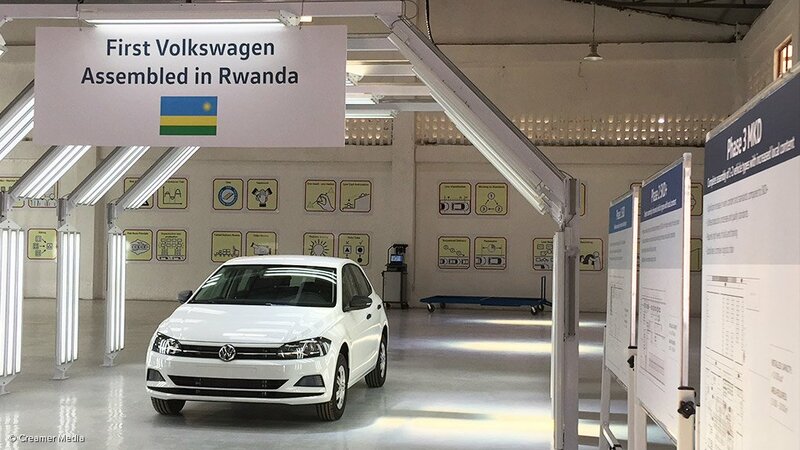 German car manufacturer Volkswagen on Wednesday cut the ribbon on its new semi-knockdown (SKD) assembly facility in the Rwandan capital of Kigali. The group also kick-started its mobility operations in the East African country. The total investment in the country for Phase 1 of the operations is $20-million, said Volkswagen Group South Africa (VWSA) CEO Thomas Schaefer. Assembly operations happen in partnership with the CFAO group, in the form of CFAO Motors Rwanda, and includes a dealership on the premises. The mobility solutions company is a 100% Volkswagen venture. Assembly operations in Rwanda follow on the start of SKD assembly in Kenya, which kicked off in December 2016. Both the Rwanda and Kenya plants are supplied with vehicle kits from the VWSA plant in Uitenhage, in the Eastern Cape. Production capacity at the Kigali plant reached around 5 000 units a year, said Schaefer. Production for the first year was estimated at 1 000 cars a year. Vehicles to be assembled include the Polo, Tiguan, Passat, Teramont (a sports utility vehicles not distributed in South Africa) and possibly also the Amarok. “We’ll see what the market demands,” noted Schaefer. He added that Rwandan President Paul Kagame was personally involved in the project from its initiation in 2016. The Rwandan government offered Volkswagen a seven-year tax holiday, starting this year, as well as duty-free parts imports for as long as the assembly plant is operational. To date, the incentives have not included halting the imports of second-hand vehicles – a fact which typically hampers the start of new-vehicle assembly in any country. There were indications that Rwanda was, however, considering this, said Schaefer. “Most cars on our roads are used,” noted Kagame, who is also the current African Union chairperson, at the opening event. “Africa does not need to be a dumping ground for second-hand cars or second-hand anything. The Rwanda new-vehicle market was estimated at around 3 000 trucks and cars a year. The combined Rwanda assembly and mobility operations are expected to create around 1 000 jobs, including technicians, assembly workers and drivers. Phase 2 of the Rwanda project could, possibly, see an expansion at the production facility to up to 10 000 vehicles a year, scaling up the number of mobility vehicles on the road, and setting up operations in other cities in Rwanda. The mobility solutions, to be launched in a staggered fashion, included corporate car-sharing, a solution in which approved company employees can book a vehicle for use on a per-hour basis; e-hailing (similar to Uber); car sharing, and shuttles, which operate on fixed routes and time tables. The majority of cars to be initially assembled at the Kigali plant will be used for these mobility solutions. Schaefer said the vehicles used to provide mobility solutions would typically be disposed of as used vehicles within two to four years, creating “an ecosystem that fed itself”. VWSA could soon sign memoranda of agreement with Ghana and Ethiopia to investigate also establishing some form of mobility and/or assembly operations in these countries. “Each country will have its own solution. Rwanda’s mobility solution will not necessarily work in other countries,” said Schaefer. The success of South Africa’s automotive industry was closely linked to the fortunes of Africa, said Schaefer, who is also African Association of Automotive Manufacturers (AAAM) chairperson. The AAAM is pushing for three, possibly four vehicle production centres on the continent, as part of a pan-African automotive deal. These include South Africa, Nigeria, Kenya and possibly Ethiopia. South Africa could, for example, produce pickups, while Kenya could possibly assemble trucks and buses, said Schaefer. Schaefer believed that the Kenya and Nigerian new-vehicle markets could grow to the levels seen in South Africa, at around 600 000 new vehicles sold a year. Schaefer said the AAAM was “pushing” the execution of this project through the World Economic Forum.